Chuck meat comes from the chuck, or shoulder, of the cow. Where the shoulder blade is located, there are two main muscles — one above the shoulder blade, called the top blade, and one below the shoulder blade, called the under blade. Chuck blade steaks can come from either of these, though the more tender varieties are generally found in the top blade area. 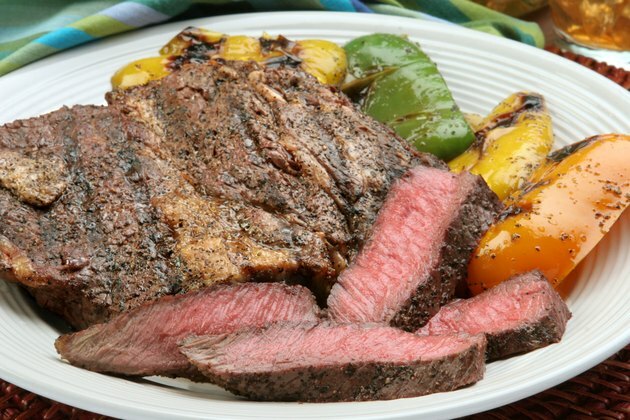 Chuck blade roasts are often cut into 1-in.-thick steaks that benefit from minimal seasoning and medium-high heat. Prepare steaks for cooking by trimming any excess fat with a sharp knife and seasoning lightly with salt and pepper. If your steaks were in the refrigerator, allow them to rest at room temperature for 10 minutes before cooking, to allow for more consistent cooking. A cold steak is more likely to char on the outside while the inside merely warms. Heat a heavy-bottomed skillet over medium-high heat and add 1 tbsp. of butter or oil, tilting the pan so the butter or oil is evenly distributed. Set the steaks into the pan and cook them for three to five minutes per side or until they reach their desired level of doneness. Variations in stove-top temperature will determine cooking times. The U.S. Department of Agriculture recommends cooking steaks to an internal temperature of at least 145 degrees Fahrenheit. Remove the steaks and allow them to rest for at least five minutes before serving. Allowing the steaks to rest will help the juices reabsorb into the meat and keep the steaks tender. If you are cooking top blade steaks, make three incisions across the line of gristle that runs along the middle of one side of the steak. Leaving this gristle intact may encourage the steak to curl and cook unevenly while cooking. Always wash your hands and any cookware or cutlery used to handle raw meat with hot soap and water to help prevent the spread of bacteria that can lead to food-borne illness.